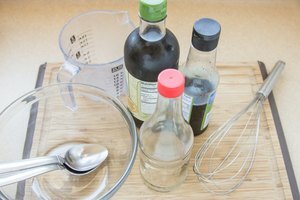 Don't panic if you can't find the correct measuring cup in the middle of a recipe. Knowing basic kitchen conversions will help you measure the correct amount using other kitchen tools. One cup contains 16 tablespoons, or 8 fluid ounces; a fluid ounce of water weighs 29.57 grams. 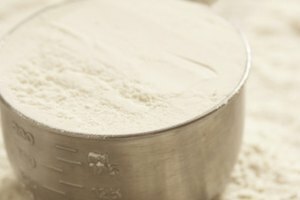 Using these conversions, you can calculate several ways to obtain 1/4 cup -- no 1/4 cup measure required. Measure out 4 tbsp. to equal 1/4 cup. Use a liquid measuring cup marked with ounces and fill it to the 2-oz. line. 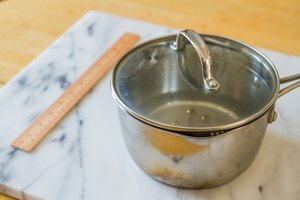 Weigh out 59.1 g of water using a kitchen scale. Fill a 1/3 cup measuring cup with water. Carefully remove 1 tbsp. plus 1 tsp. to get 1/4 cup.